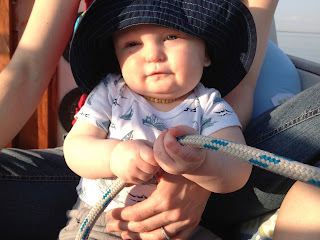 Hobo Sailor: Baby on a boat! Wow, congrats on the baby! I started following your blog when we took off sailing, around the time you took a hiatus on blogging. 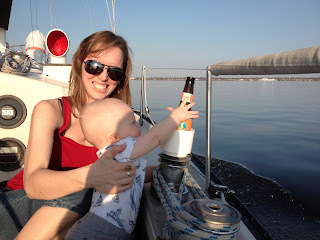 I loved the term "hobo sailor" ever since I came across your blog and used it to describe ourselves. I'm pretty proud that we made do with what we had, and didn't realize what a necessity an autopilot was until we had sailed over 4000 miles hand-steered. Welcome back. I hope there are more posts to come! I saw a P-38 on eBay & was curious on your opinion of taking one Across the big pond and through the French canals? Glad you're back and look forward to more posts! I just wanted to thank you for putting this blog out there. I ran across it about 1 1/2 years ago and have been obsessing on going cruising ever since. It took about 8 months of constantly bugging my husband about the idea for him to jump on board but we are now planning and working on saving money to do a cruise in the near future. Thank you again for letting people in on your adventure and dream and inspiring others to dream big too. It's so good to see you guys again. I have missed you. You left so abruptly I was worried that you gave up the life. I'm so glad to see you back on the high seas. Very happy for you and your family of course, although I wish that you were still blogging! I would very much like to talk to you. This is exactly what I want to do when I graduate from high school (might have to save up a bit first haha) and I would like to absorb as much information as possible from as many sources as possible. Anyway hope that you are doing well. Best wishes.